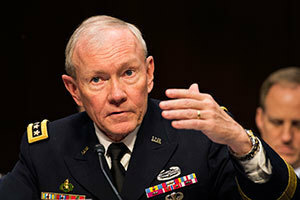 Gen. Martin E. Dempsey, the chairman of the Joint Chiefs of Staff, will speak at the University of Notre Dame on Sept. 6 (Saturday) — the morning of the home football game against the University of Michigan. As the 18th chairman of the Joint Chiefs of Staff, Dempsey serves as the principal military adviser to the president, the secretary of defense and the National Security Council. By law, he is the nation’s highest-ranking military officer. “Notre Dame has a long and close relationship with the U.S. military going back to Father Corby during the Civil War, and continuing today through hosting one of America’s most robust ROTC programs,” Michael Desch, professor and chair of the Department of Political Science, said. “Given that, it is appropriate that our nation’s top soldier, Gen. Martin Dempsey, would come to South Bend to deliver a major address on the national security threats our country faces.” The Rev. William Corby, C.S.C., served as a Union Army chaplain attached to the Irish Brigade in the Civil War and later became the president of the University of Notre Dame. Prior to becoming chairman, Dempsey served as the U.S. Army’s 37th chief of staff. He is a 1974 graduate of the United States Military Academy and a career army officer. All three of his children have also served in the U.S. Army. The lecture, which is free and open to the public, will begin at 10:30 a.m. in the Hesburgh Library building’s William J. Carey Auditorium. The three ROTC detachments on campus — Air Force, Army and Navy — and the Notre Dame International Security Program in the Department of Political Science are sponsoring Dempsey’s visit. Originally published by College of Arts and Letters at news.nd.edu on August 27, 2014.